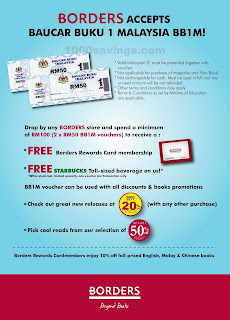 BORDERS accepts Baucar Buku 1Malaysia BB1M and rewards membership + FREE Starbucks drink! 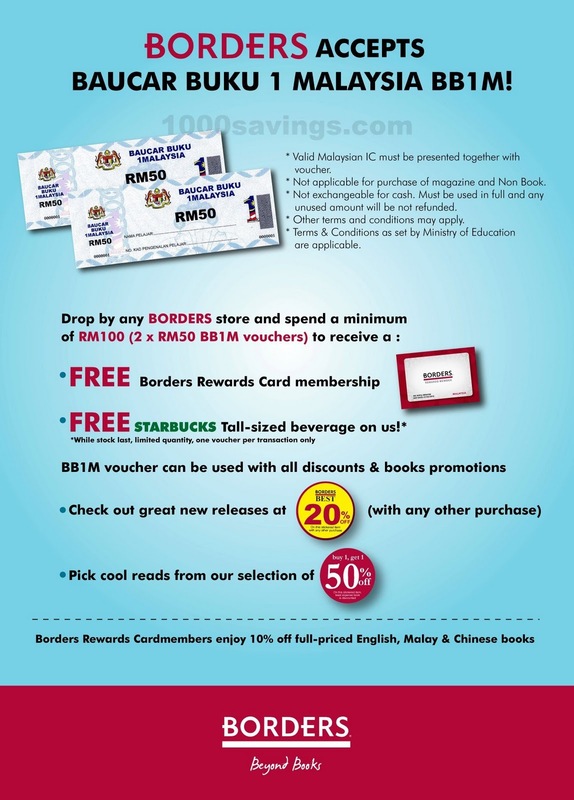 Borders Rewards Cardmembers enjoy 10% off full-priced English, Malay & Chinese books. Lot G16, G16A-C & 114A-D, Ground & 1st Floor, The Curve, No.6, Jalan PJU 7/3, Mutiara Damansara, 47800 Petaling Jaya. Lot 1F 93 & 93A, 1st Floor, Queensbay Mall, No.100, Persiaran Bayan Indah, 11900 Bayan Lepas, Pulau Pinang. Lot T-216-B, 3rd Floor, The Gardens Mall, Mid Valley City, Lingkaran Syed Putra, 59200, Kuala Lumpur. Lot L1-39,46,47 1st Floor, Tropicana City Mall, No 3 Jalan SS 20/27, 47100 Petaling Jaya. No. 2F – 36, 37 & 38, 2nd Floor, Bangsar Village II, No. 2, Jalan Telawi Satu, Bangsar Baru, 59100 Kuala Lumpur. Baucar Buku 1Malaysia is initiated by Prime Minister of Malaysia, Y.A.B. Dato' Seri Mohd Najib bin Tun Haji Abdul Razak, tabled in Budget 2012. For more information, please refer to Garis Panduan Pemberian Baucar Buku 1Malaysia (BB1M).